Sometimes you don’t have the time or are simply too lazy to cook – no shame in either. Even in lazy periods we still want to cook healthy vegan meals; the trick is to be well prepared. 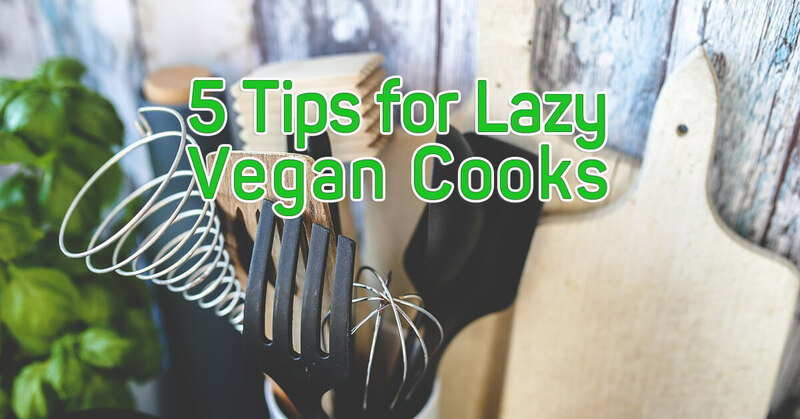 The following list for lazy vegan cooks comes from my experience of more than 45 years of lazy cooking, with interruptions of time-consuming meals and cooking classes. At the end of this post, I’ve added links to sources that have helped me cut corners without sacrificing a healthy diet. Flaxseed (yes flaxseed is a herb). 3. Sauces: like teriyaki, soy, mustard, balsamic vinegar and “oyster sauce” are great starters in marinades for plant-protein sources like tofu, beans or tempeh. They are also brilliant in salad dressings. 4. Satisfying ingredients: This means staying away from processed foods and choosing fresh or frozen vegetables and grains instead. I don’t recommend canned/tinned foods, they are not good for us; as an example canned tomatoes, nothing wrong with the tomatoes it’s the packing that’s the problem – the BPA (Bisphenol A), tomatoes are highly acidic, it draws out more of the BPA into the food from the lining. Tomatoes in bottles or glass containers are fine. 5. Take a cooking class: When you have been trained by a chef, you will be able to cook faster and pair foods in more interesting and healthy ways. It’s well worth taking a class. Maybe you can find a local class that will be fun to meet and learn with like-minded folks. There’s also quite a few online classes, Udemy has high-quality e-cooking classes , I recommend “Raw Vegan Desserts – Gluten and Dairy-Free” and “Online Vegan Vegetarian Cooking School”. Last but not least, the following are 5 vegan recipes for lazy cooks. Click on the recipe name to get to the recipe. 4. Guide to Make Homemade Pizza – Healthy just use pita bread as the base. BPA free cans are pretty easy to find. Not the cheapest on the shelf but they're around.